Charise Creates: Sew Mama Sew Give~Away Day! I'm very excited to be a part of Sew Mama Sew's Give~Away day. If you haven't visited my blog before, I am a designer who loves to create sewing patterns and write for sewing magazines and books. I also love to share free sewing patterns and tutorials. 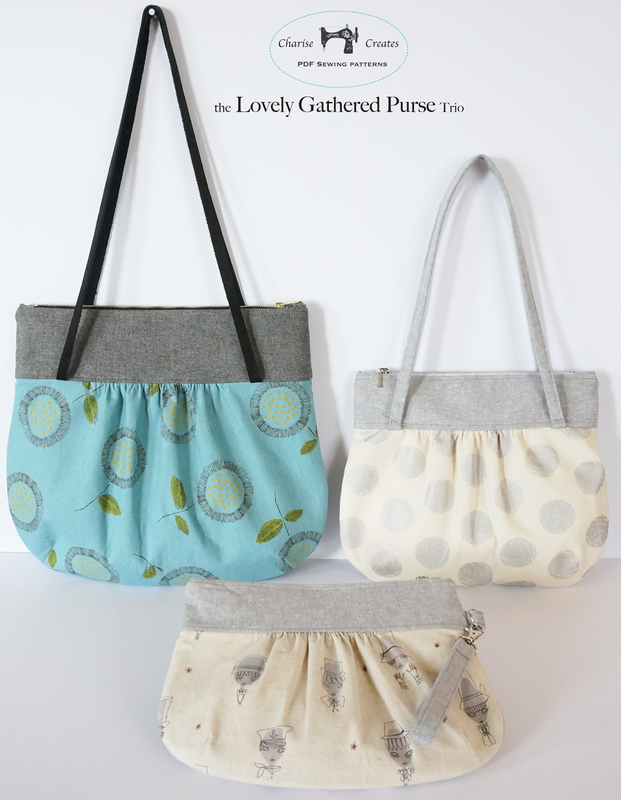 I designed a new purse pattern - The Lovely Gathered Purse Trio. I'm giving away a copy of the pattern + a kit to make the clutch you see pictured! This pattern is an easy make for a last minute Christmas gift! The clutch has a metallic silver zipper and silver clasp and D-Ring. The fabrics included in the kit are Essex Linen from Robert Kaufmann and a cotton/linen print by Annika Wester for Kokka. The pattern includes three different sizes. The Shopper is the largest at a very generous 16" x 14 1/2". I absolutely love this size. If you like big purses this is the size for you! The "Around Town" is a perfect 13" x 11"
The clutch is compact but roomy enough for all your essentials when you want to carry a smaller bag. the inside has a zipper lining pocket. I have some more fabrics picked out for this bag. I can't wait to make some more versions! The pattern is a PDF download that includes the pattern for all three sizes plus 11 pages of easy to follow instructions and illustrations! Please leave a comment below by December 12 at 5 p.m. PST. below and I will pick a winner. Give away is open to all commenters! Beautiful! I love your fabric picks for your next bags. Oh my! This is fabulous and the fabrics picks are terrific too. Eye candy as always. Great pattern and lovely fabrics. Your bags are wonderful! I'd like to make that large one for my daughter. It would make a great bag for her and the baby. Love the pattern, great fabrics and metallic zips. Charise your patterns are always so fun and perfect! I'd love to win - I need all 3 sizes!!! Love, love, love this pattern! How I'd love to win it - thanks for the wonderful giveaway. I love this bag design! 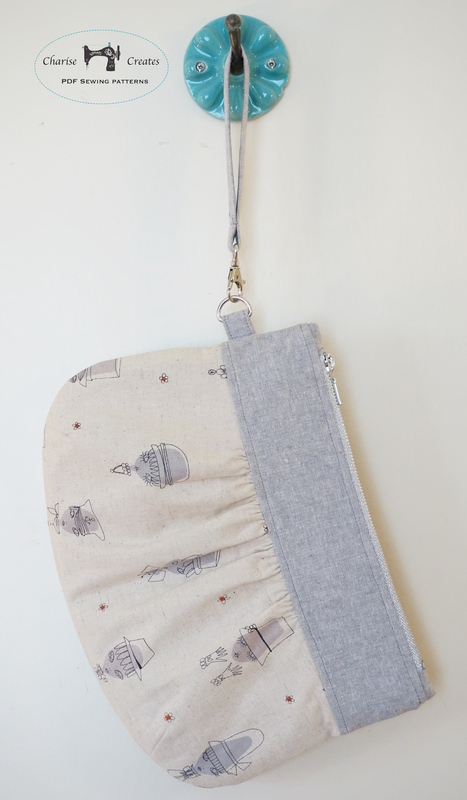 I really enjoy making all sorts of bags, so this would definitely be right up my alley! This bag is stunning!! I love the fabrics also! I love your bags, and really appreciate getting all 3 sizes in the one pattern! The fabrics you are chosen and just perfect! Pretty pattern. Love all your work. Love the pattern especially the clutch size....the pleats are perfect! This looks like such a delightful bag- I especially love the clutch size! And the fabrics you've picked out are wonderful too! Thanks for your giveaway Charise! Your 3 bags are gorgeous - love the gathered detail - and your fabric choices are gorgeous. Thanks for the chance to win the pattern and materials for the clutch. I would absolutely love to win this pattern! The pattern looks lovely, as do the fabrics. I'd love to win to try my hand at making this clutch bag. Yummy as always! Pick me pick me!!!! Love them all. Thanks so much for the giveaway. They are lovely! thanks for the chance! These bags are beautiful, thanks for the giveway! Great, versatile pattern! Love the fabrics too! Thanks so much for the giveaway! Hello! I'm an italian woman! Thank you very much for this giveaway!!! I love making handmade bags! I like the pattern and the fabric of your clutch and I hope to win!!! ;-) Bye bye. Love the fabric in the giveaway. Your choices for the follow up bags are great too. Especially like upper right corner - it looks like it may be an arrow fabric in the blue. I would use the largest bag to replace my tote I take to work everyday, and try to gift the clutch, but......as I said the fabric is great. 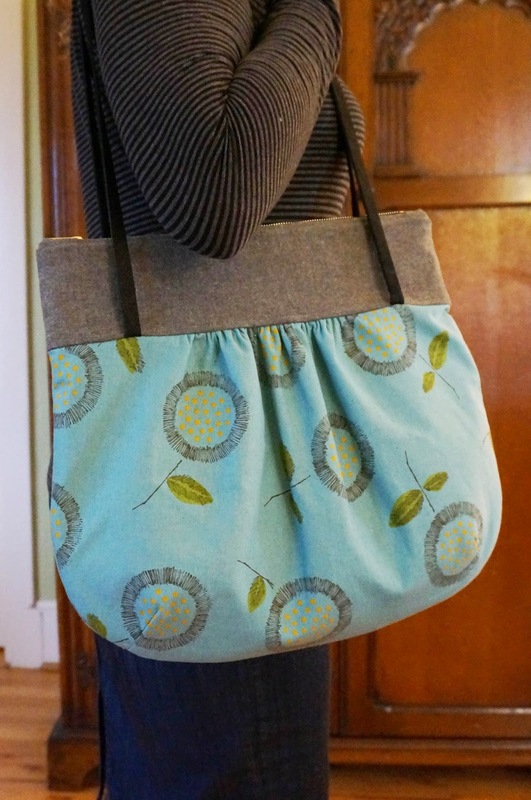 I love this bag and your fabric choices! Thank you for the give away. The purse is very nice, hope to win. Love your fabric choices, I would love to make the purse. Thanks for the chance. Very cute pattern. I can see my girls liking this bag. Thanks for the great giveaway. hopefully will be! Thanks for the giveaway! That is such a cute bag pattern. I can see my granddaughters carrying one of those. Amazing bag pattern but moreso your fabric choices are amazing. I love this pattern and the fabrics you have chosen for each of them. That silver dot bag is great! Love the big version purse ! 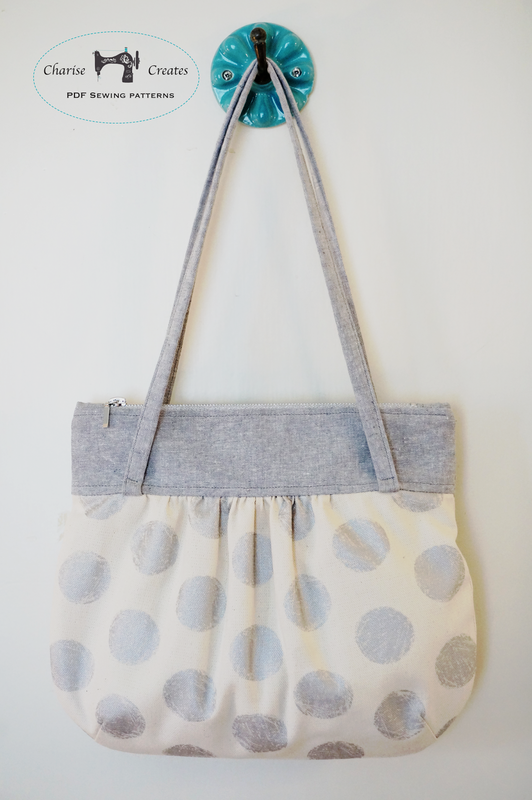 i would love to make the shopper. love all your patterns. Thats a lovely design. I love the fabrics youve chosen too. I know just who to make the clutch for should I win. What fun. Very nice pattern. Beautiful! I would love to make that sweet little clutch. I'd have a hard time giving it away, but in the spirit of Giveaway Day, I would find a deserving person on my holiday gift list. Then I'd make an Around Town for myself. :) Thank you for the giveaway offer! Are you kidding me? THIS IS AMAZING!! Thanks so much for the opportunity! Your new pattern looks wonderful. And I just love this gorgeous kit you put together, so very perfect. Thanks for such a generous giveaway. Ooooh! I love bags and I really love this one! Thank you! Totally wonderful - what a great giveaway! Great pattern and lovely fabric! Thanks for the chance! These are so cute! I have not had much luck with zipper sewing and am hoping to master it in the new year! HI, such a neat clutch! Love it! Thanks for sharing! What a terrific giveaway! Your gathered purse pattern is lovely-especially like the clutch version. The fabrics you picked for your next projects are really pretty. Can't wait to see those when you make them! I haven't tried making a purse yet but your directions look pretty clear even for a beginner like me! This will give me the chance to master those darn zippers! OMG I would love to win this prize. I am just getting into bag making! Oh these are lovely. thank you so much for being so generous. All three of the variations are lovely and the fabric you picked is gorgeous. Thank you! I usually make tote bags but have never made a handbag. If I win, this will certainly add something to my skill set. I love your bag pattern in all sizes. Thanks for the chance to win! And to all of you too. This would be so great to win. That gray fabric is too sweet! This looks like a very handy pattern, with those three sizes to choose from. What a wonderful gift all three would make as a set! I love this bag! Thank you for the generous give away! the fabric is so sweet. that clutch pattern is the perfect size for me. thanks for the giveaway. Seasons greetings from Winnipeg, Manitoba, Canada! Cute purses! Really like the different sizes, would love to try making a few.. Thanks! I love this pattern and the versatility, too! If I don't win I will definitely put this on my must buy list. This is simply lovely! I am a sucker for a cute bag pattern. 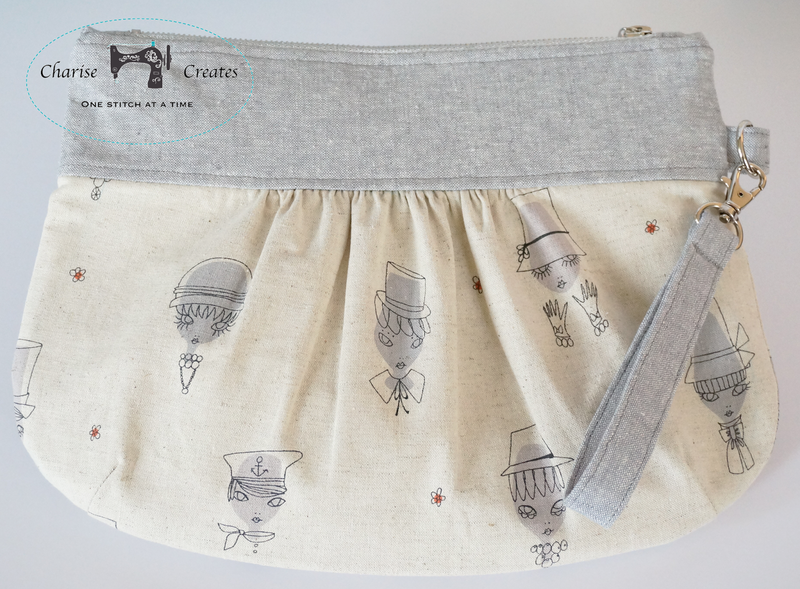 That clutch design and the fabrics you chose are soooo cutie-licious! You are so talented!! I love making bags and your patterns look fantastic. Thanks for the giveaway! I like the bag pattern and your blog. What a great pattern! I am digging that metallic zipper! Thank you for the giveaway! 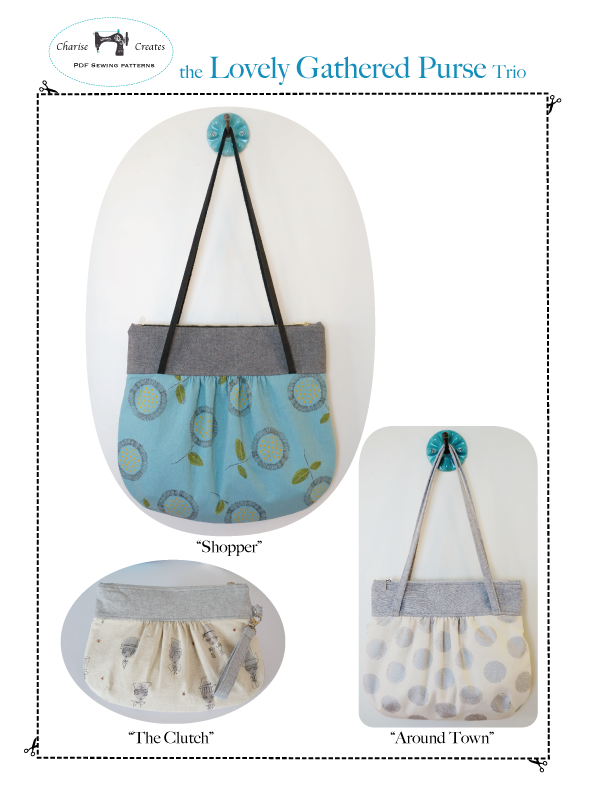 How clever, one pattern multiple sizes and of course your sewing is perfection ! Thank you for your giveaway! Following by email for loads of inspiration! I love the bags. They would make such nice gifts for my family. I love your pattern for the great bags. Thanks for the chance to win your giveaway. I really like your bag patterns! I really would like to win this great purse. It would fit so many needs with my girls. But I have never won anything in all of my 73 years, so if could you direct me to the spot I can order it I sure would appreciate it.. I tried to find it but didn't have any luck. I have looked all over but can't find it. Sure want it though. Great pattern, very versatile! I can see the bags in many different fabrics. Your bags are lovely, would be nice to try one. Love all the bags! Thanks for the pattern. Have a wonderful holiday season! Sweet bag ~ really love the clutch and the fabric is lovely too! What a gorgeous pattern. I love the clutch version but that shopper is divine too. Those bags are sew cute. They'd make a lovely set. I love bags. Thanks for the opportunity to win. What a generous giveaway! The clutch is adorable! I love that clutch - it's adorable! What an awesome giveaway! I'm a sucker for bags of any kind but this trio is so nice. I would love to win. I've not made a bag yet but really want to. I don't make purses (yet) but this cute one makes me want to start! That is a very cute bag and doesn't look to difficult! Thanks for the giveaway! These bags are so cute! That huge one is my favorite! Love these bags and your choice of fabrics. Thanks for participating in the Giveaway Day. Fun bags. I can see making several in different sizes for many uses. Love the big one! Thanks so much. Very nice bags! Love all the sizes. I love seeing your fabric selections for each of the bags. Nice patterns. You know I love all of your stuff.....the fabric you picked out is awesome! I love that silver zipper too! Awesome giveaway and love the three in one pattern too. I LOVE this pattern! And the fabric just fits! 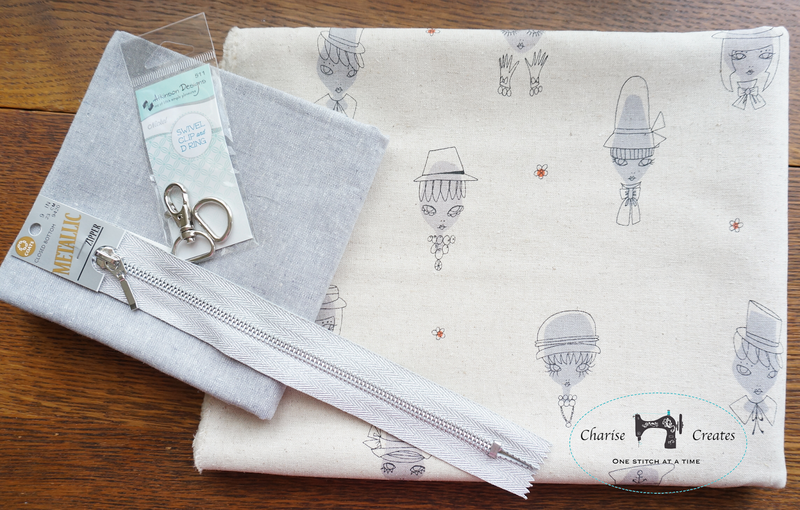 Charise...you just make the most lovely things! I love the white fabric you have chosen for the clutch, it's perfect. What a fabulous pattern! Thanks for the chance! I love handbag patterns! Yours are lovely. Thanks. I love your bags - the Fabric combinations are so pretty. What a wonderful pattern to have! OH! I love that you've included three sizes! What a great idea!! I'm going to take a look at more of your patterns. :-) I'd love to win this! Your Gathered purses are beautiful, I wouldn't know which one to start sewing. Your taste for fabric is perfect! I totally love this pattern and the fabric you picked. What a sweet bag! And thanks for the kit! I always struggle finding the extras (the right zipper and accessories) so It's nice to know these will work! Hope I win! Beautiful and so much fun. Very cute bags! Thanks for the chance to win! Purse looks beautiful. Love a big bag. Fingers crossed. I LOVE to sew bags. Thanks for the chance to win ! These look great! 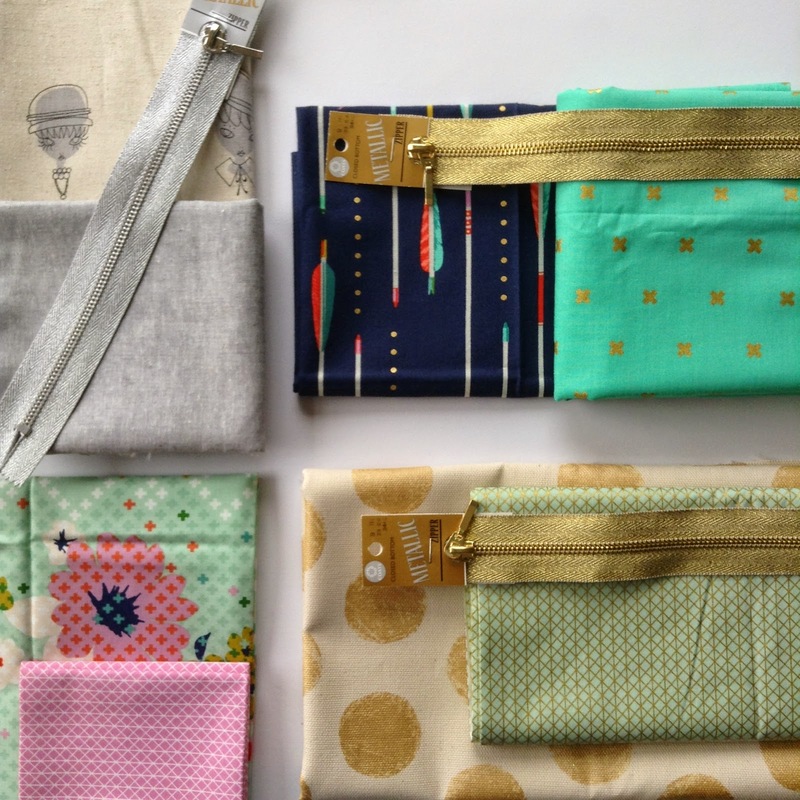 I love the fabric selections you have made for the new bags! I have an addiction to making bags, and yours looks great! I am a longtime follower via email and I just love your paper piecing patterns. It is nice to see that you are also designing cool bags.